I got to interview Jennifer K. Mann! Mrs. Benson is a lot cooler than my fourth grade math teacher. My third grade math teacher was scary. And mean. And she wore brown. Every day. Most of us have a memory of a scary teacher. 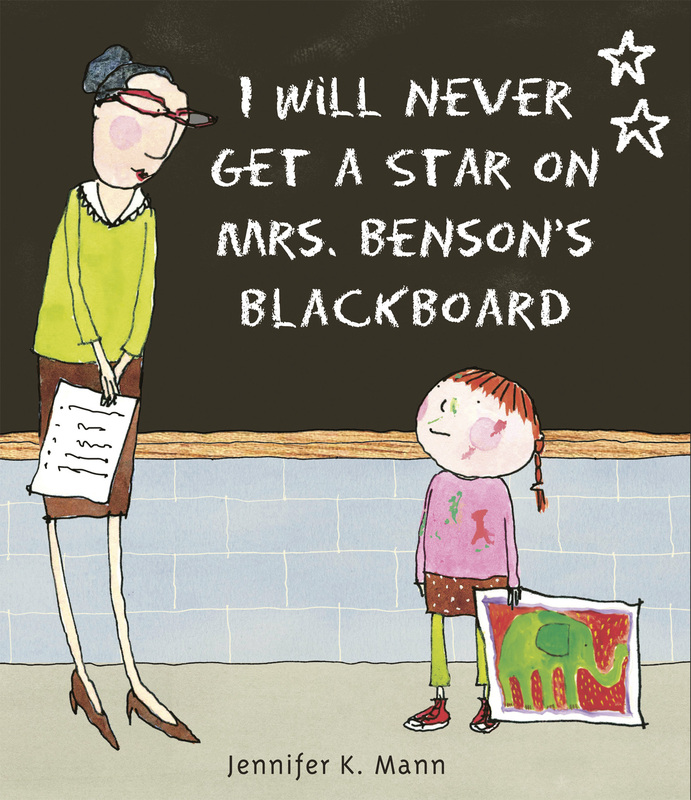 Author Jennifer K. Mann captures these memories and the feelings that come with them in her new book, I Will Never Get A Star On Mrs. Benson’s Blackboard. The gracious writer and illustrator agreed to be interviewed for my blog! 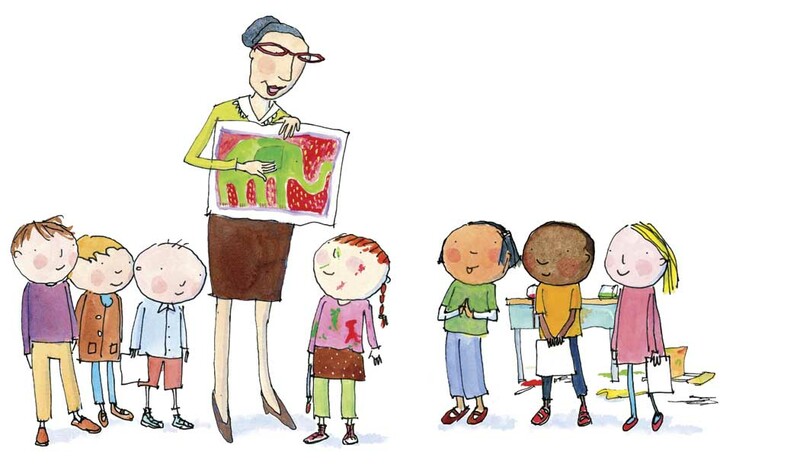 Can you tell me about your inspiration for Mrs. Benson’s Blackboard? I read it was from your own childhood. I had a tough second grade year, with a teacher who was really hard to please —I kept a messy desk, and maybe didn’t get the math problems right the first time, and she scared me a little. My memories of that year, and the nervous feelings it inspired, have stayed with me ever since. The story of that difficult year was the first thing that I jotted down when I began in earnest to pursue a future in children’s books! I don’t think there are too many kids in the world who haven’t wrestled with the anxiety of pleasing a difficult-to-please teacher! What’s the message (in the book) that you want to resonate with kids? I want kids to know that it is okay to march to the beat of our own drums! So we’re a little messy. So we daydream more than others. So what? We all have gifts and talents that are worthy and unique. We just have to let them become obvious by being true to ourselves. Mrs. Benson points out Rose’s talent. I love that you attended Blueberry Hill Elementary. Will you use that name in a book someday? Oh, I would love to! I also spent much of my childhood living part-time (divorced parents) in a magical house on a hill covered in wild blueberries. The house was also called, coincidentally, Blueberry Hill! I think there is no doubt that it will appear in one of my stories sometime. You write that it is a really long process to get a book from start to finish. How did you feel when you first saw a completed copy of your book? Oh my goodness. The feeling is almost indescribable. I used to be an architect, and it was such a neat thing to see a design go from paper to building. But so many people and processes were involved that it was also easy to feel a little detached. But to see a story, which has been squeezed from my memory and my emotions and my blood, sweat, and tears, in the form of a book, illustrated by me too…!! Wow!!! Of course I cried. I think I will cry every time, because it is an amazingly emotional life event. How do your own kids respond to your books? Any words of wisdom from them? My kids are both amazing artists and writers. So they always weigh in throughout the process. I have to say, some of my best critiques come from them. They are both quick to see where the story is a little flat, or doesn’t quite ring true, or could use a little something to raise the stakes. I am so grateful to have their support. And to see the pride on their faces at my first ever book launch—that alone was worth the entire long journey to get there. Rose daydreaming. I did this during Math. Do you think Rose would be friends with Ginger and Lyla in Two Speckled Eggs? Oh for sure. Actually Rose and Ginger share some DNA, so either they would love one another dearly and be inseparable, or be prone pointing out one another’s faults, despite being pals. Lyla and Rose, however, would be fast friends. They are not alike in many ways, but they would have a mutual, unspoken appreciation for the other’s free spirit. Where to find the book and other info. Max and Calvin like the book! You can buy the book at your local bookstore or find it online. 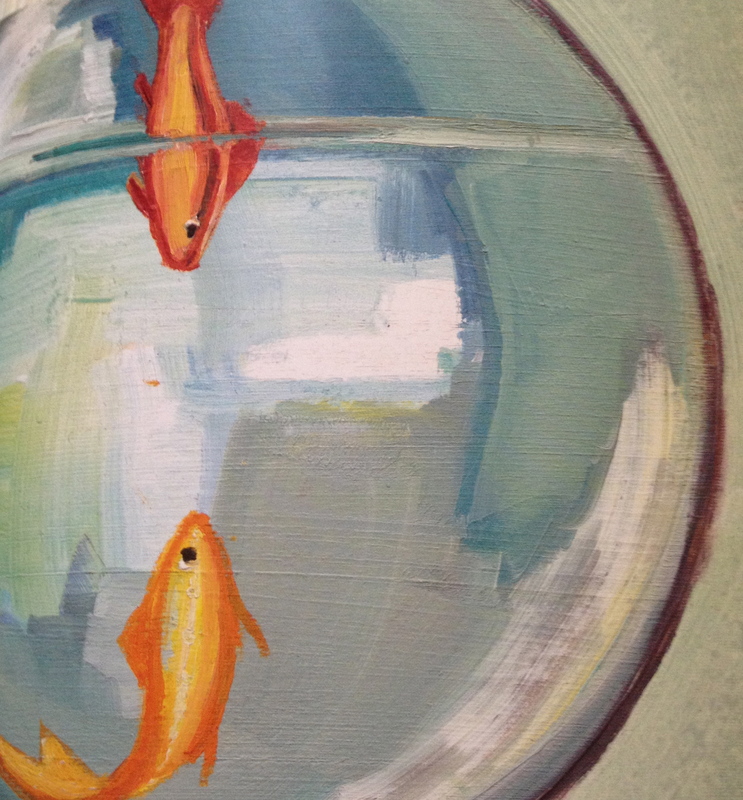 Find out more about Jennifer, her books, her art, and read her blog on her website. 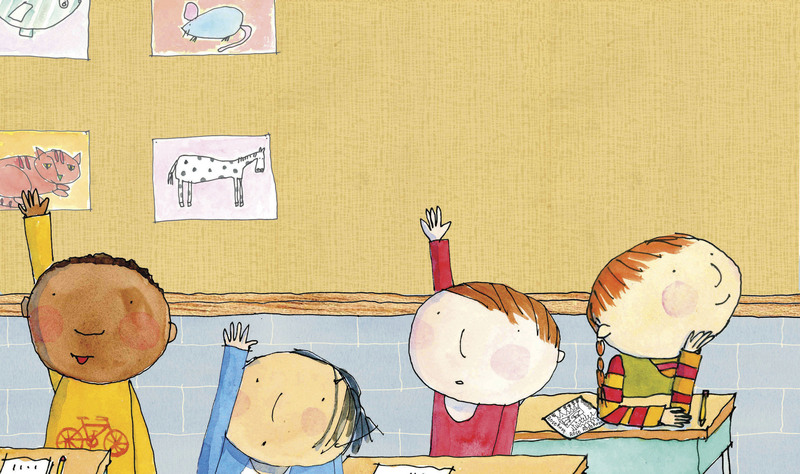 She has another book Sam And Jump slated to come out in 2016 by Candlewick Press. Bernadette drops in on Paul. We returned from vacation and our black goldfish was orange. My brother let out a wail, “Blacky!” Our babysitters/pet sitters had kindly replaced my brother’s fish when he met his maker. They just forgot to keep it the same color. You can’t blame them. They were teenagers and our pets seemed to always implode when we traveled. Our hamster escaped, pooping all over the house, chewing things up. Our cat threw up, strayed from his litter box, and set off the burglar alarm. Once we arrived home, our neat freak dad would, well, freak out. At least the Kleinfeldt girls replaced the fish. When I went to college, my family forgot that my goldfish, Fred and Ginger, were in my room where they were left to a sad fate. I learned about it on a call home. Bernadette shows Paul the world. The jacket description alone pulled me in. 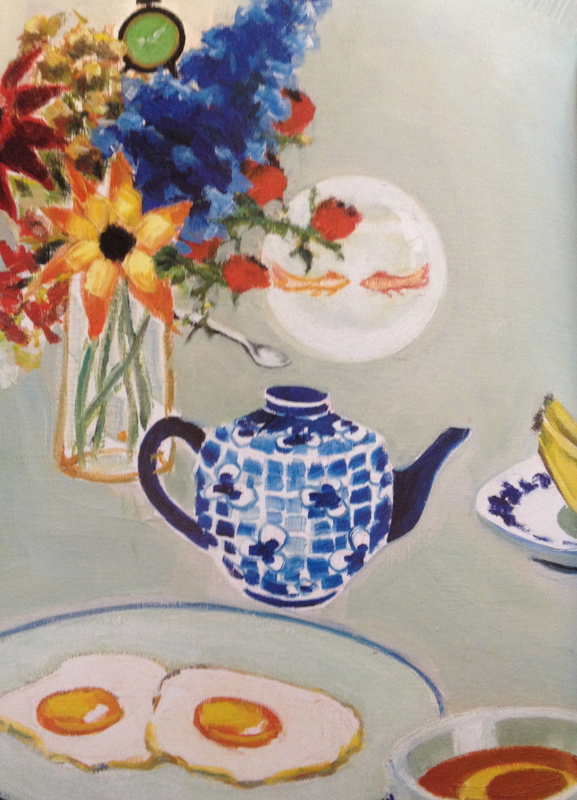 It states that Lamb “painted the pictures for this book while her baby daughter slept by her side.” And the painter and sculptor, “lives in a studio with tall windows on a quiet street in Paris.” These idyllic descriptions match Lamb’s lovely paintings. We found this book at the Public Library of Greater Cincinnati at the Clifton branch. You can buy it here and watch a video reading of the book. Visit Rosy Lamb’s website to see her sculpture and paintings. Speaking of local libraries, our branch is moving right around the corner from us in May into the Parkview Manor! How do you know a book is a hit? Ask a six-year-old if they like it. If their eyes get big and they retell you the entire story at a fast pace, complete with dramatic hand gestures, I’d say it’s a win. 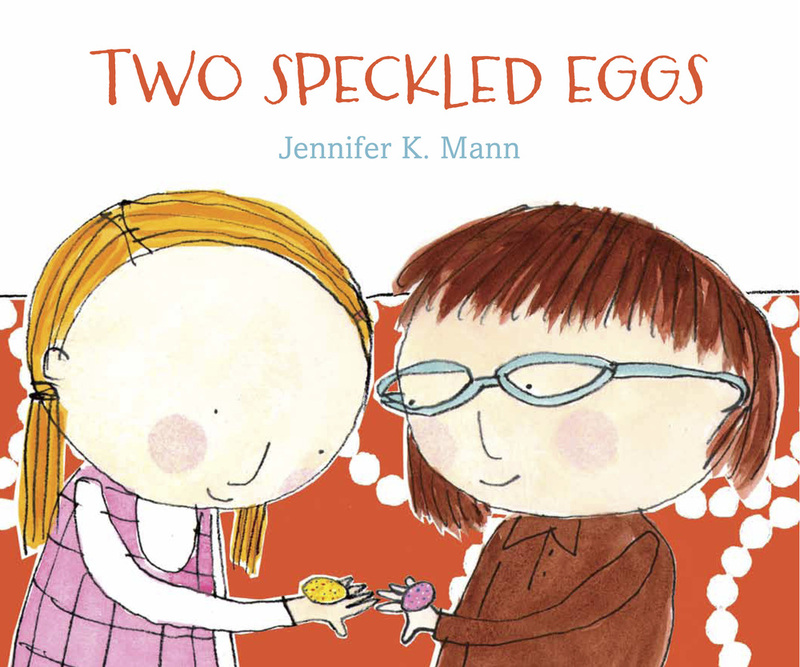 This was my niece Margot’s response to the book Two Speckled Eggs written and illustrated by Jennifer K. Mann. Calvin and I love this book so we got it for Margot for Christmas. Margot and Calvin love each other. They also love Two Speckled Eggs. Let me tell you about Margot and Calvin. These first cousins have a soft spot for each other. 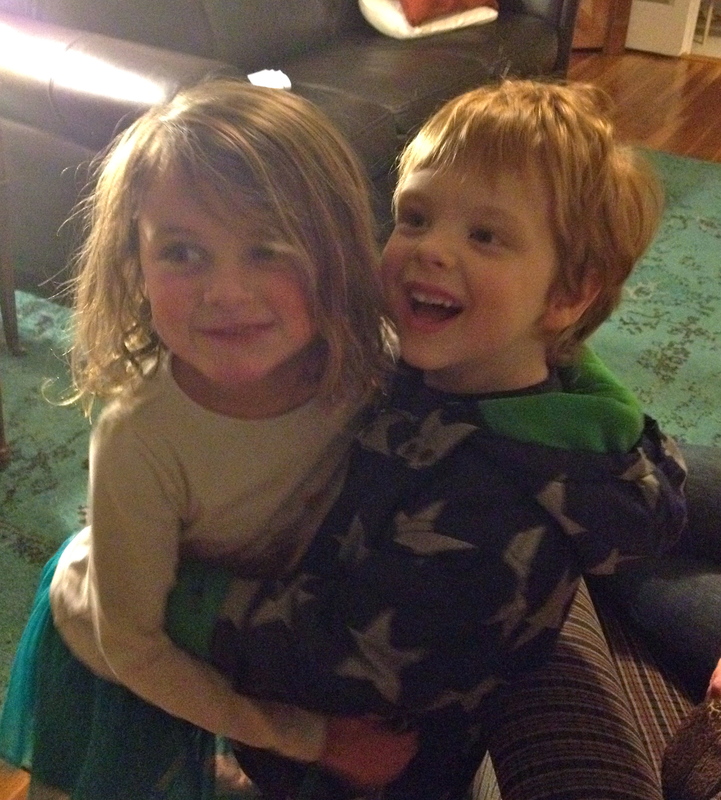 When they kissed on vacation last year, Max proclaimed, “They’re married!” (The boys were four and Margot five at the time.) This made us all laugh, except maybe my brother. Fast forward a few months and Calvin started wearing a fake ring. When someone asked him where he got it, he seriously said, “I got it when I married Margot.” When I tried to tell him he really wasn’t married to Margot (and it’s not the Civil War era) he got mad so I let it be. Lyla gives Ginger the best gift of all. Back to the book. I think most of us can relate to remembering the weird kid at school or maybe we were that weird kid. In Two Speckled Eggs it’s Lyla Browning, the kid who smells funny and brings a tarantula to school. Then there is Ginger who is having a birthday party and doesn’t want to invite Lyla. Ginger’s mom, like all moms everywhere, insists that she invite Lyla to her birthday party. This book puts a special twist on the message that the person you think is weird is surprisingly interesting and fun. I love everything about it: the story, the illustrations, and the descriptions. Ginger’s friends don’t end up listening to her at her birthday party and they don’t appreciate her special “silver and gold cake.” Except for Lyla Browning. Lyla also gives Ginger the best present – a homemade nest with two chocolate eggs in it. After everyone leaves the party, Ginger and Lyla pretend to be birds and peck at the beloved silver and gold cake. Calvin and I love reading this book together. We love reading about the tarantula, the cake, the chocolate eggs, and we really love the part where they pick at it like birds. (I have to admit that in a house full of boys, this feminist makes sure we read about girls.) But it’s not a book for girls it’s just a great book. We discovered this book at the Clifton branch of the Public Library of Cincinnati and Hamilton County. You can buy it directly from its publisher, Candlewick Press. Mann has another book I Will Never Get A Star on Mrs. Benson’s Blackboard coming out in June. It looks awesome. And who doesn’t remember not getting stars at some point in school? Special shout out to Leslie Cannon for serving as my Editor At Large. 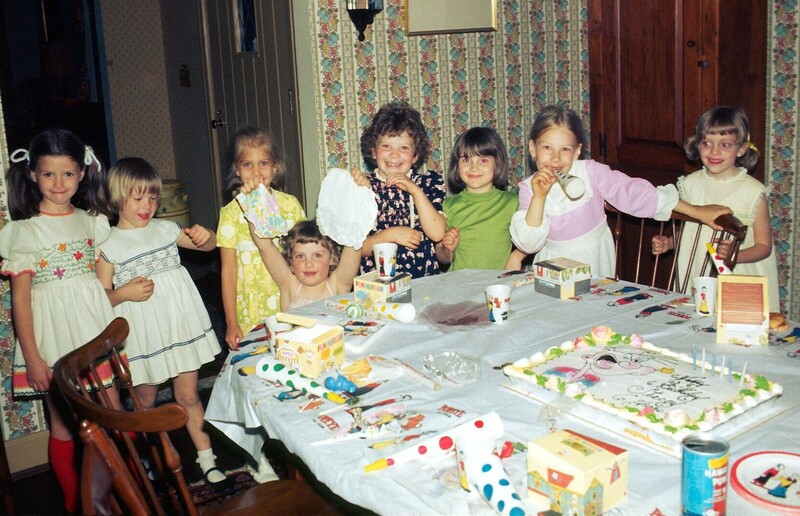 When I was a kid, all the girls in my class wanted to get invited to Stacey’s house. Her home was complete with lots of rooms, teenage siblings, a beautiful mom that wore Dr. Scholl’s, a silver Trans Am, an outside playhouse, guinea pigs, and a secret passageway that led to a secret room. I’m happy to say Stacey and I are back in touch. She’s a vet and mom to two kids. They gifted us two of their favorite books hailing from their former home of Maine. In 1836, a side-wheel steamer ship set off with an unusual cargo – circus animal, people, and a band. A festive crowd gave it a big send-off. Tragically, the boat caught fire, people perished, and rumors lingered that the animals made it to islands on the Maine coast. Chris Van Dusen was inspired by these true-life events when he wrote the gorgeous (and happy) The Circus Ship. 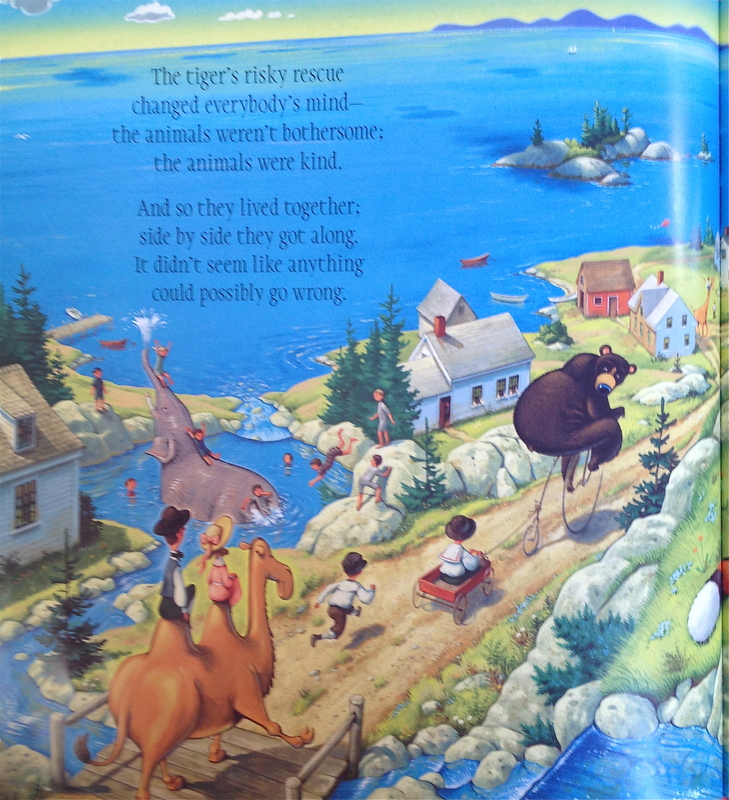 His ship capsizes off the coast of Maine and the animals swim to shore and begin living among the people. At first they are seen as pests but in a plot twist, “the animals weren’t bothersome, the animals were kind!” the villagers come to love them. This isle of Maine is crazy for animals. When the evil circus owner comes back to claim the animals, the townspeople disguise their new friends. This page of the book never fails to be fun; you have to find the hiding animals. My boys never tire of it. If you’re a parent, you’ve experienced the beauty and stress of toddlerhood. Everything is a joy and a death trap. Imagine if your baby was a giant. This is the premise for Kevin Hawkes’ The Wicked Big Toddlah. Toddie, a Maine baby, is so wicked big he comes home on the back of a flatbed truck. The antics of Toddie and an entire town trying to care for him are hilarious. “How do you think that toddler got those big clothes and that big hat?” Max asked. “This caution tape is holding the people back because that diaper is the stinkiest thing in the world!” said Max. 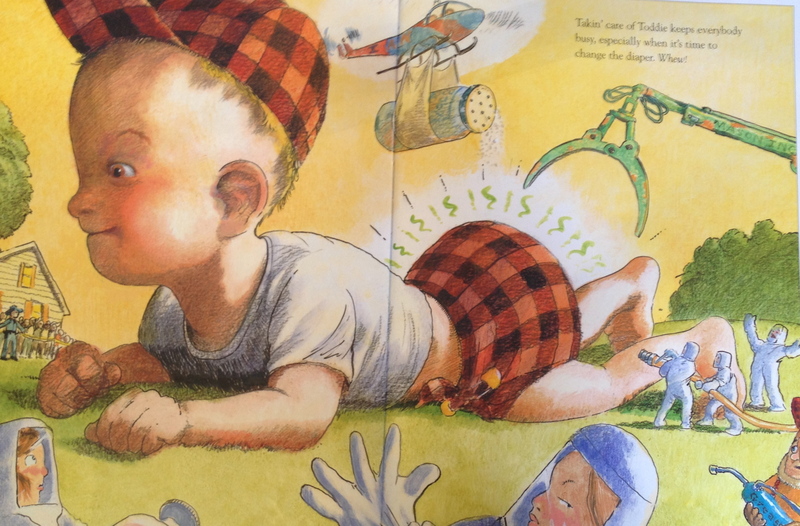 A favorite page for my family is when he gets his diaper changed; a helicopter hovers with talc. Poop never gets old with this crowd. 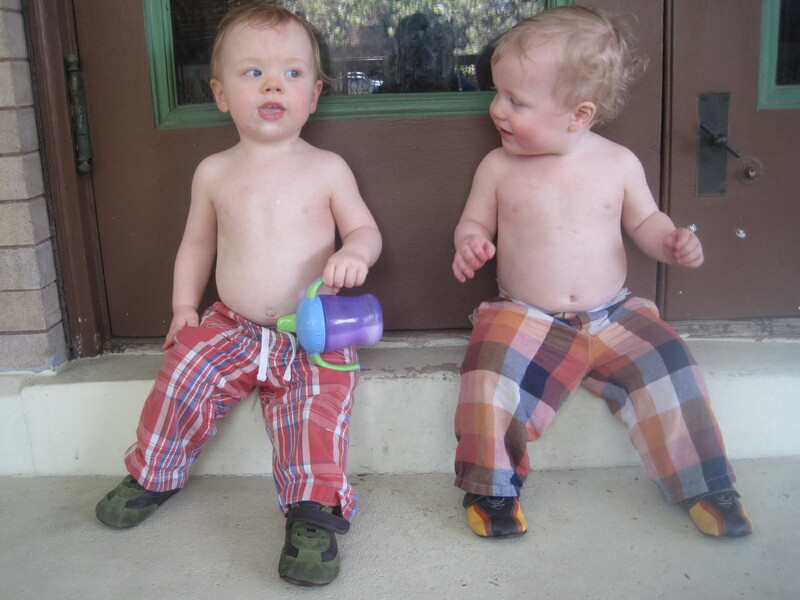 My memory of having two wicked big toddlers is pretty sharp, through a sleep-deprived lens. Thinking of a giant toddler gives me a wicked big stomach! Buy The Circus Ship from Van Dusen’s website and he’ll direct you to Indie bookstores. I’ve been meaning to check out his book about Cincinnati native President William Howard Taft. President Taft is Stuck in the Bath looks hilarious. I’ve bought The Wicked Big Toddlah from Cincinnati’s Blue Manatee Bookstore and deCafe. If they don’t have it, they will order it. If you buy it off Hawkes’ website, he will sign it. My boys also love The Wicked Big Toddlah Goes To New York. Calvin and Max were wicked cute toddlers.